Hello there my beautiful readers! It’s Monday again and I’m so happy to share something with you! I know this is out of topic but, I’ll be starting a new job and I can’t contain my happiness! The packaging looks simple and nice which I really like! Now, let’s move to our main topic today! Let me talk about my experiences and opinions about the newest addition to Althea Korea’s growing line of skincare and beauty products. I was one of the lucky bloggers to receive the Waterful Green Bamboo pads and Skin Calming Relief Cream. 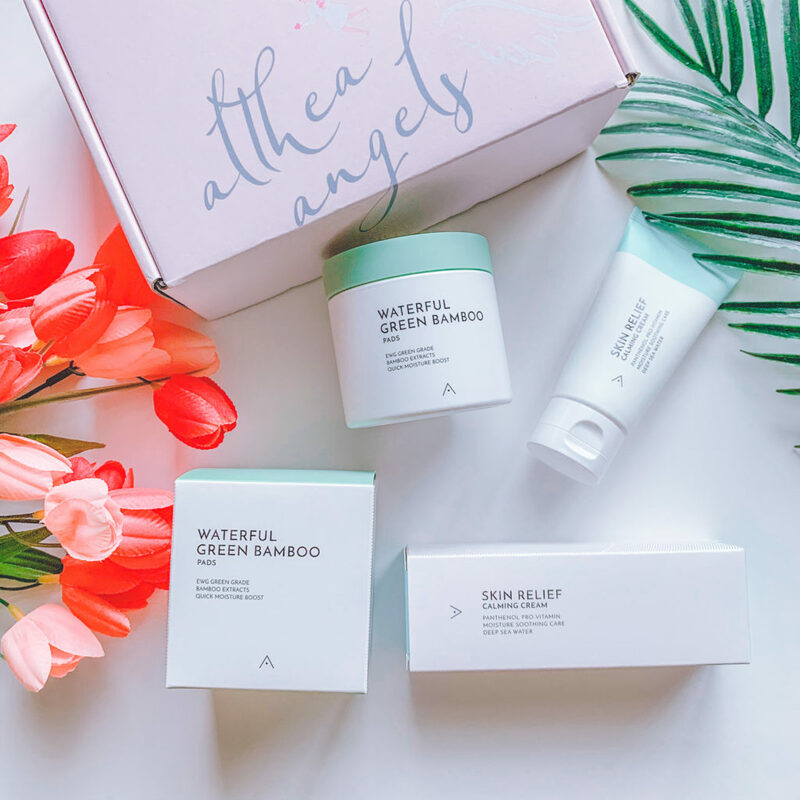 I want to say thanks a million times to Althea Korea for letting me try these products! I now live in the US but I can tell you, it’s so easy for me to receive their packages. The shipping time is quick. I got this last week and I’ve tried this within a week so I can share my experiences and short review about it. For those who are interested, please keep on reading. As you can see on the photo, the packaging looks simple, neat and clean. I like Althea Korea’s consistent well-prepared packaging! The pads and cream came in boxes are easy to open. So after the busy days and stress that I’ve been through this week, I was able to write this first impression for you. I used the pads as a face mask. I have a dry under eyes and I thought I need something to pamper this puffy eyes. As soon as I opened the container, it smelled good and refreshing. It was good and I don’t want to take it off my face. I let it stayed on my face for 10 minutes and it felt so hydrating. I don’t really know if I used the pads right but, after I removed them on my face I dabbed a small amount of the Skin Relief Calming Cream. Just like the Waterful Bamboo pads, it smelled good to me. I used it to massage my face up to my neck. These two products are best to use together because you’ll instantly feel that refreshing and hydrating effect. We need these and they are perfect for the hot summer season. I will be posting more about it on my Instagram account. I’m just in a short social media break right now but once I recover from something that made me feel broken the past few days, I’ll share my overall review about it. We are all humans. We need to rest. We need to pause for a moment, feel the pain of our battles and move forward. Thank you for spending your time with me today.